The bailey bridge is a type of portable, pre-fabricated, truss bridge. It was developed by the British during World war II for the military use and now extensive use in the world. 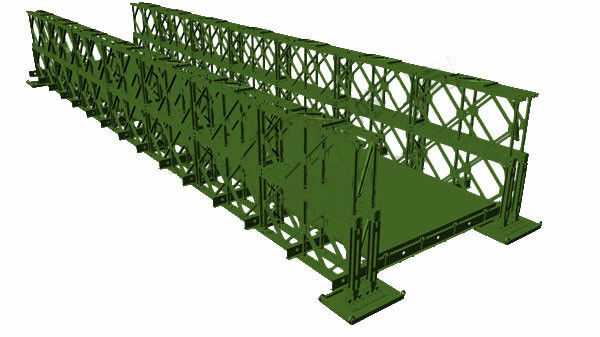 A Bailey bridge had the advantages of requiring heavy equipment to assemble. The steel bridge elements are small and light enough to be carried by trucks and lifted into place by hand. They are strong enough to carry heavy trucks and tanks. Yes, the factory covers an area over 100,000 square meters. 2. When can I get the quotation ? We will quote within 24 hours after we get your inquiry. If you are very urgent to get the price, please call us or tell us in your email so that we will regard your inquiry priority. Our products are manufactured strictly according to national and international standard, and we take a test on every process before delivered out. If you want see our quality certifications and all kinds of testing report, please just ask us for it. We are a factory and be able to give you the competitive price. Please trust the quotation we would give you, it is professional one. 5. Why should you chose us? Chose happens because of quality, then price, We can give you both. Additionally, we can also offer professional products inquiry, products knowledge train(for agents), smooth goods delivery, excellent customer solution proposals.